“White flowers” often are invoked in the descriptions of a good many white wines. Rheingau Rieslings come to mind, as do better chardonnays from Chablis and a great many Alsatian wines, particularly Pinot Blancs and Gewürztraminers. As the weather warms up, these wines begin again to adorn my dining table and, likewise, do the white florals in my fragrance wardrobe (the gardenia, paperwhite narcissus, sweet orange blossom and their voluptuous consorts, rose, iris and tuberose). Yesterday at the Etro boutique on Madison Avenue, I was reminded of Royal Pavillon, a lovely white floral which debuted back when I was in junior high. “Elegant” and “refreshing” are the words that immediately come to mind. The perfumer (anonymous) melds floral and green notes to fine effect, conjuring up an olfactory glass house filled with blossoming plants amid respiring verdure. Gardenia assumes pride of place, but is tempered all along by a green accord. Tuberose kicks in after a few minutes on my skin, providing ample replacement for a missing bottom range. 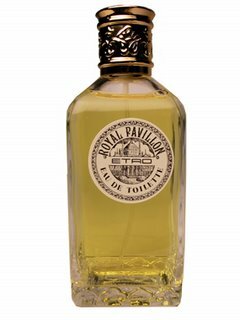 Royal Pavillon dries down to something just un peu soapy and freshly bathed, with a hint of vetiver and sheer musk. Like a good white wine, the floral notes here are balanced by the crispness which lingers. It is not a profound fragrance by any means, but a very fine scent in eau de toilette concentration and worth seeking out in the shower gel, too. And while it bills itself for women, I think this is as safe a bet as ever for the jocks in the room. I just *discovered* your blog and what a lovely addition it is to my perfume perusing! Very nice to read about Etro fragrances as well; Shaal Nur is a beloved favorite, as is Dianthus, but as you know, not much is written about this house. It's often difficult to even find notes listed online (I am nowhere near a B&M that carries Etro) and I want to know about all their scents! Thanks for the very useful reviews. Continuing with the Etros, I find you in great form! I like that despite the brand's opulent prints and orientalised physique, the scents are anything but: a dichotomy that pleases me. The Etros are wonderful, especially on men! Why don't more men wear perfume...we must try to do something about that, I think. Thanks for this lovely review - unfortunately, perfumes affect me badly so i try to avoid them. However, this does not happen with perfumed shower gels, thank goodness. I find I can use a scented shower gel, even if the scent is quite strong, so your review is very helpful in deciding whether to try this scented shower gel or not.